Imperial Auction raises $25,800 to continue Coonawarra Wine Region grape grower, winemaker and community support. 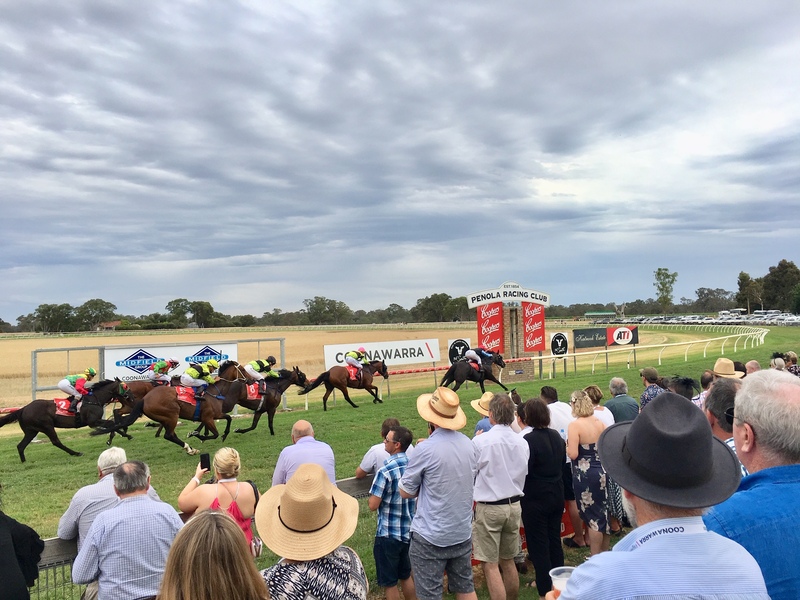 The 36o South Coonawarra Vignerons Cup is, without doubt, one of the State’s best country race meets in the picturesque surrounds of the Penola Racecourse. 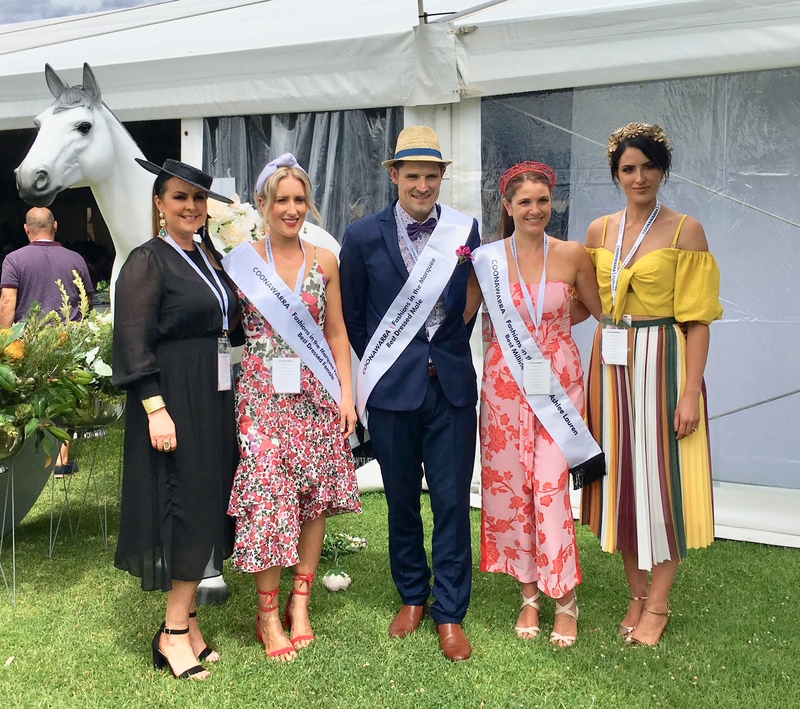 This year’s event was no exception with the Coonawarra Vignerons Marquee continuing to deliver an outstanding day on the track for the running of the 37th annual 36o South Coonawarra Vignerons Cup won by Tahnee Tiara with placings by fittingly named Pass the Glass and Strategic Glass taking out third. The marquee offered its guests with the chance to sample the region’s best food, including this year’s presenting partner’s 36° South beef pairing with Coonawarra’s world-class wines, while watching an eight-race program unfold and Super Sweep providing much anticipation for those that drew a horse and took away a sizeable prize pool. 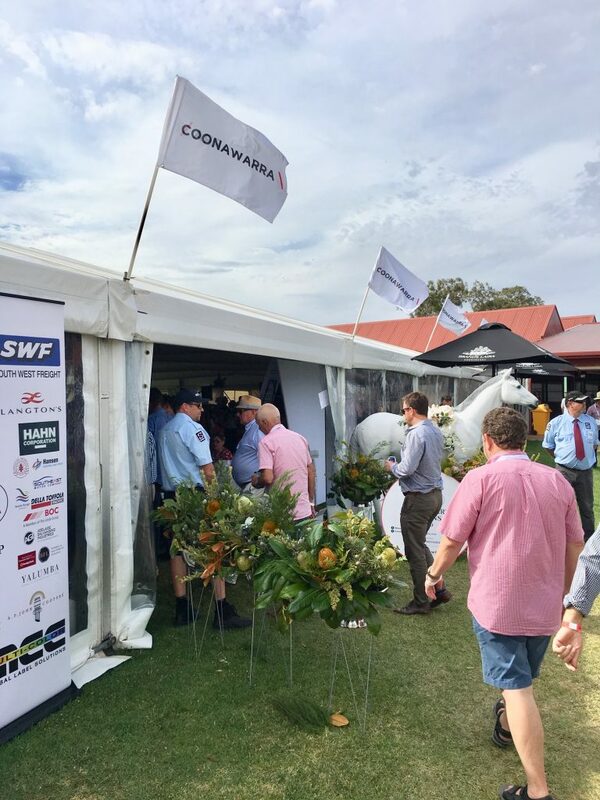 The weather wasn’t without its challenges with a lower 28° temperature day, mid-morning heavy rains, humidity rising and a late breeze enabling unprecedented marquee opening to an exclusive view of the horses in the parade ring for the over 700 racegoers in the Coonawarra Vignerons hosted Marquee. Tim Bailey, Cup Committee Chair provided the official welcome to the patrons Wendy Hollick, Doug Bowen and Doug Balnaves, The Member for MacKillop Nick McBride and his wife Catherine, CEO of Wine Australia Andreas Clark, Mayor of Wattle Range Council, Des Noll, CEO of SAWIA Brian Smedley, TRSA’s Cassandra Norris, The Advertiser’s Katie Spain, The Border Watch’s Katie Jackson, Naracoorte Herald’s Amy Maynard and Fashions in the Marquee judges Ashlee Kalantarian and Kate Hastings and importantly acknowledged all the sponsors and contributors who make the day possible. “The strong sense of community and guests that continue to travel from afar and over a great number of years to be part of this day is highly valued by the Cup Committee.” Tim Bailey said. There were features on and off the track with Blanco Catering providing a seated breakfast, lunch and afternoon tea keeping all guests nourished and this year guests were treated to local 36o South beef showcasing the premium local agricultural produce and spoilt for choice when it came to the wide selection of Coonawarra world-class wines. Winemaker Andrew Hardy displays the Parker Coonawarra Estate 2010 First Growth Cabernet Sauvignon Imperial which fetched the highest bid. MC Jane Ferrari, former wine communicator of the year and Auctioneer Miles Pfitzner kept the energy high for an entertaining Auction, where the eight imperials averaged $2,812 up on last year’s average of $2,063, and the highest bidder taking away the Parker Coonawarra Estate 2010 First Growth Cabernet Sauvignon Imperial at $5,200. Also auctioned were two beautifully crafted A P John Coopers’ barrels that fetched $1,600 and $1,700 respectively. Fashions in the Marquee was a highlight of the day, judged and presented by Ashlee Kalantarian of internationally recognised millinery label, Ashlee Lauren presenting the Best Dressed Millinery to Naomi McShane for her red detailed crown and she can now enjoy selecting or creating an Ashlee Lauren headpiece with a $200 voucher for her efforts. Best Dressed Female sponsored by Perception Personal Styling was presented to Laura Lewis, who was contemporary and on trend in her floral dress and matching turban and accessories taking home the $300 Perception Personal Styling e-voucher. Best Dressed Male was awarded to Peter Guyett, who had gone to significant effort accessorising his navy suit and floral shirt with a bowtie, fresh flower lapel, pocket square and protecting himself from the afternoon glare with a well paired hat. It was worth the attention to detail as Pete was presented with three magnums, one each from Redman Wines, Rymill Coonawarra and Zema Estate. 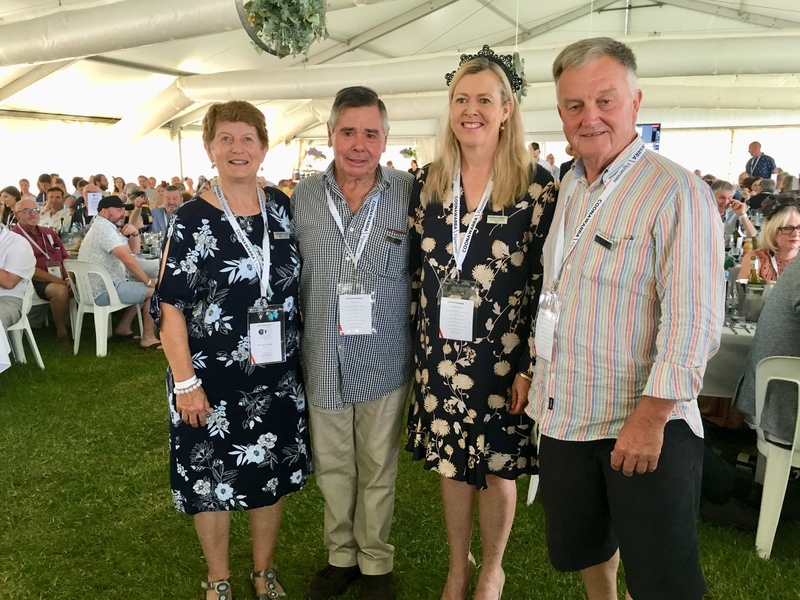 A further presentation was made on the day with Pete Balnaves, President of Coonawarra Vignerons acknowledging the role of Coonawarra Vigneron’s patrons and inducting two new patrons, with long-serving association members Michelle Stehbens and Bruce Redman awarded the honour. Pete said “The Vignerons have long felt the need to highlight outstanding contributions that individuals have made to the organisation and to the region of extended periods of time. To highlight the efforts that these individuals have made, Patrons of the Coonawarra Vignerons are periodically announced.” “Truly worthy of this accolade, both Michelle and Bruce epitomize a “can do” attitude with little fuss and fan fair, and demonstrating plenty of professionalism and are ambassadors of the Coonawarra Wine Region.” Pete said. Michelle Stehbens and Dan Redman, on behalf of his father Bruce Redman who was absent on the day, were presented with a badge commemorating their patron honour. “We would like to take the time to thank our sponsors, who without, the Cup day would not have grown to the success we now experience. We look forward to continuing the partnership and hope that you may have the chance to support each of them,” Ms Nunn said. Platinum Sponsors: South West Freight and MCC Labels. Silver Sponsors: Adelaide Galvanising, BOC, BFL, Bendigo Bank, Brandstoker, Della Toffola Pacific, Hansen Design & Print, Seguin Moreau, South East Motor Company and Wattle Range Council. 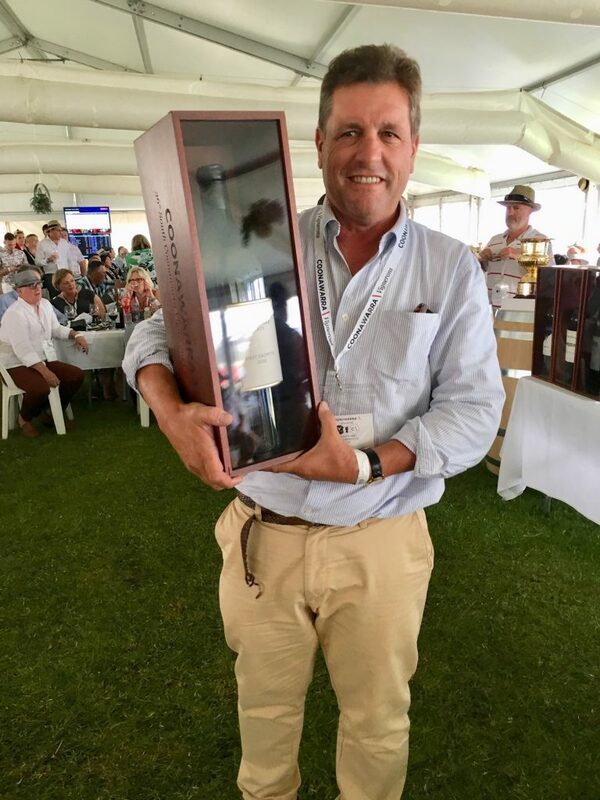 “Special thank you to our suppliers Veolia for supporting our Cup with waste management, Wagner’s Rose Nursery for donating our roses, Aqua Essence for the water supply and to the marquee supplier Grand Events and Caterer Blanco Catering.” said Coonawarra Vignerons Cup Committee Chair, Tim Bailey. A photo gallery will be uploaded to the website in coming days. If you like the commemorative polo shirts displayed by our Cup Committee, please contact our office enquiries@coonawarra.org and we can post direct to you for $69 each. For those looking to secure a ticket to next year’s event, be quick to register when tickets are released following the Cup Launch in November. Save the date for 16 January 2020.